Head of the HSC, Khaled Mishri, said he does not recognize Hafter who is starving the people of Derna with his siege of the city (Photo: HSC). 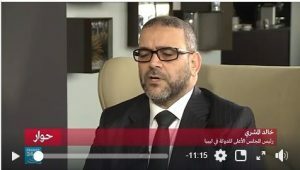 The head of Libya’s High State Council (HSC), Khaled Mishri, said that he does not recognize Khalifa Haftar as the Commander-in-Chief of the Libyan Army. Rather, he only recognizes Faiez Serraj as the Commander-in-Chief of the Libyan army and his appointed Chief-of-Staff of the Libyan Army as General Abdel Rahman al-Taweel. Mishri was speaking to French television station France 24 after the Paris conference on Libya on Tuesday. Hafter had been appointed as Commander-in-Chief of the Libyan National Army (LNA) by the internationally recognized House of Representatives before the December 2015 Libyan Political Agreement. Mishri said that he had informed France at the time of receiving his invitation to the Paris conference that he would sit on the same table with Hafter in recognition of the reality and fait accompli on the ground, but that he did not recognize Hafter as a legitimate force. With regards to extending his hand out to Hafter, Mishri questioned how he could shake Hafter’s hand while 130,000 Libyans in Derna were under fire from Hafter’s LNA forces and were unable find anything to eat – and Hafter has been the one strangling them for two years ago. Mishri said that he had stipulated that a cease-fire should be imposed in Darna and safe corridors be opened (for humanitarian aid and people to move safely) as a positive messages to be sent before the Paris meeting. He said that the Paris meeting was an important milestone in solving the Libyan problem, but it was not a decisive meeting in ending the crisis. He added that many topics had been postponed, such as the immediate termination of parallel institutions and the in the refraining from dealing with them. Mishri said that ‘‘red lines’’ had been passed and that he must transcend others for the sake of the nation, and that what is now presented as a fight against terrorism (by Hafter) is but a liquidation (by Hafter) of his political opponents. Mishri said that the city of Derna had fought terrorism and had expelled the defeated ISIL which went on to gather in Sirte. Not all those who carry arms in Derna are terrorists, and I am against terrorism in all its forms and types. In Benghazi, there was terrorism and terrorists, but many leaders of the revolution were with Hafter who gave them medals for bravery and heroism, and then he categorized them as terrorists and then he fought them. On his political leanings, Mishri admitted that he was a member of the Islamist Muslim Brotherhood which he said he had never denied. However, he said that he did not represent the Muslim Brotherhood now, and that he had nothing to do with their work. He said that he now represents the High State Council in all its shades. Referring to the impasse in the political process and the failure of the House of Representatives (HoR) to pass the election law for the planned December 2018 elections, Mishri said that the Constitutional Drafting Authority (CDA) is an elected body by the Libyan people, and the House of Representatives (HoR) only has to issue the referendum law for the Libyan people to vote on the draft constitution by acceptance or rejection. He added that no one may confiscate the will of the Libyan people or prevent them from voting on the draft constitution produced by an elected body. Mishri said that he had proposed to the French, who had agreed, to include representatives of the Bunyan Al-Marsus forces (the mainly Misratan forces that had conducted the fighting on the ground in Sirte against ISIL) to the Paris meeting, but time ran out and they could not attend. With regards to former Qaddafi supporters, Mishri said that they were part of the Libyan people, and any Libyan citizen is entitled to stand for any position unless they are wanted by the law. On the Libyan judiciary, Mishri said that it is an independent judiciary with a supreme authority, and it is one of the few institutions in Libya where there has been no political division. Mishri said he was against any outside interference in Libya and from any state.